Today is 5th day of lighting art production at site. We finished application of Barrisol (stretch membrane fabric) on the metal wire yesterday,We started to joint 2 major materials - Mesh structured "Lighting Tree" made of optic fibre and plastic drinking straw, and irregular shaped wire structure.At the time of jointing 2 major materials, the entire vision of lighting art started to emerge.Since these 2 major elements have common structural method as woven mesh structure, once 2 elements joined together, they generated the harmony of organic structure. Finally we also completed a couple of lighting artwork as a set. We almost complete the entire artwork. 妻がライティングツリーの手直しをしていると通りすがりの老夫婦と孫娘が興味深く話しかけてきました。和やかな雰囲気。こういった光景が屋外での活動の魅力ですね。when my wife was doing touch-up work of "lighting tree" part. 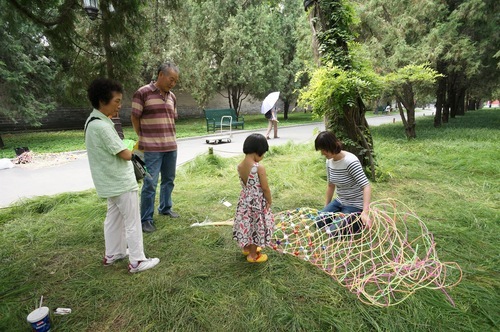 the old couple and their grand daughter passed by and started to communicated with my wife. It was so peaceful moment. I love this kind of ad hoc happening. This is wonderful unexpected experience in outdoor nature. Barrisolで出来た天幕とストローでできたライティングツリーの二つの部材が交わる瞬間です。どちらもプラスチック素材でできた人工物ですが、交わる瞬間は人工物とは思えないワクワク感がありました。 2 major elements come　together. 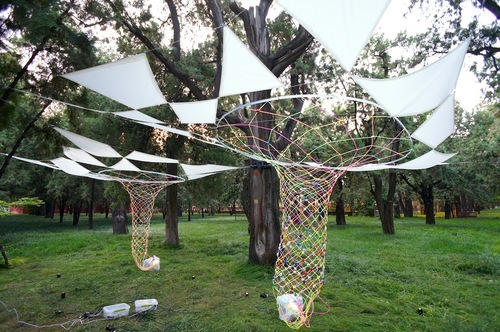 however our artwork is completely made of plastic material, they generates an exciting moment. デザインの意図である白い天幕に投影される木漏れ日。この白い天幕は木々の枝葉から切り取られる空の景色をモチーフに形作られていますが、同時に光が生む陰の表情が投影されることも意図されています。白い膜に落ちる木陰が奇麗だと思いませんか？ the sunlight shined on the white Barrisol membrane, it cast the shadow of　tree. don't you think it's beautiful? やっと二つ目も取り付けが終わり、空間全体に緊張感が出てきました。元々は自然の樹木以外に何も無かった空間に、人工物である私たちのアートインスタレーションが存在することで周囲の木々との関係性が出てきました。自然界では異質であるプラスチック素材が形を変えることによって自然と呼応する生命体として生まれ変わりました。We also completed the 2nd artwork. now we can really feel the entire volume of our art installation. 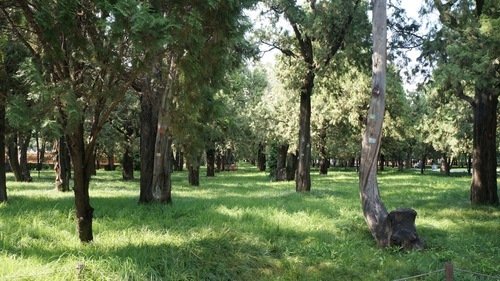 Originally the site was just open space with only trees around. but after we created this man-made feature, the surrounding environment started to generate echo of　nature and artificial elements. Now our artwork started breathing. 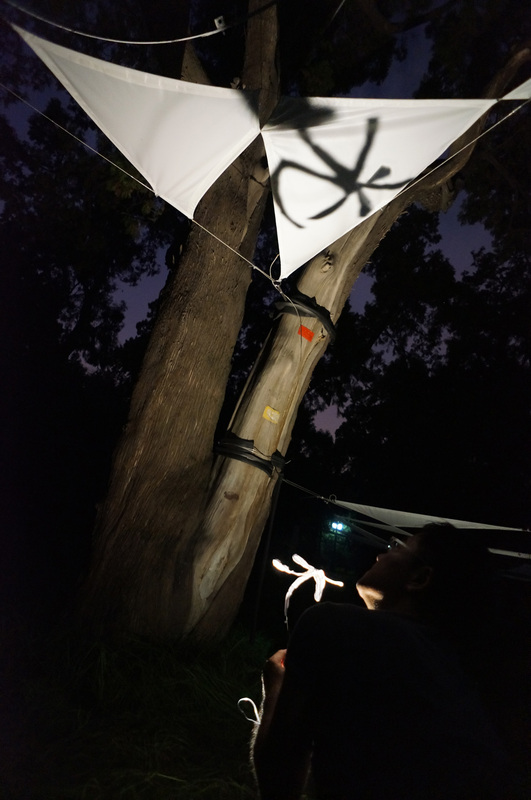 次の報告をお楽しみに。we connected the illuminator (LED lighting) with Lighting tree. so it can work as lighting art installation now on. but unfortunately we have to stop at this point. we have to go back to Hong Kong without checking the lighting effect. because our flight is just before evening time. It's shame. and still some small art installation part not finished. we will continue by next time in Beijing. 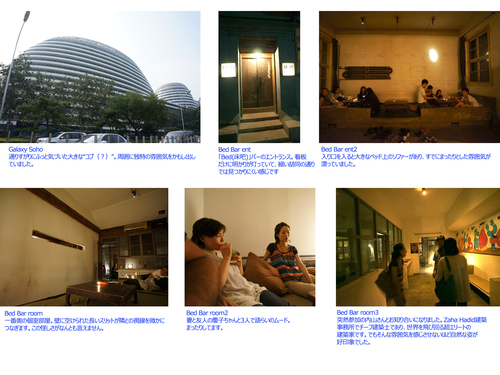 JP media in Beijing also featured us! 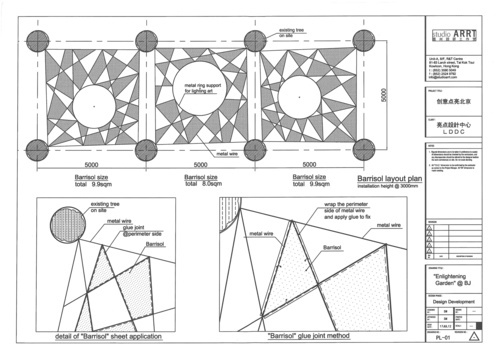 It's a layout plan of "Enlighting Garden/魅光奕林". 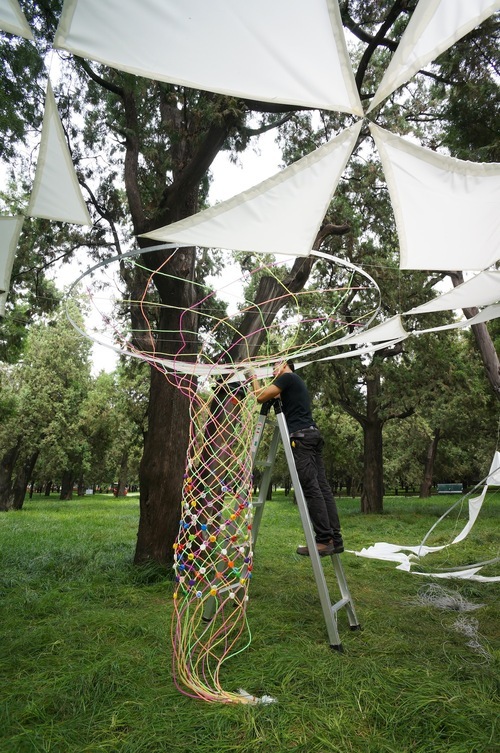 Through the methodology of art creation, Enlightening Garden is performing as a catalyzer to realize the balance and beauty between natural light and artificial light, while co-exit with the rich of ancient aura in woodland. 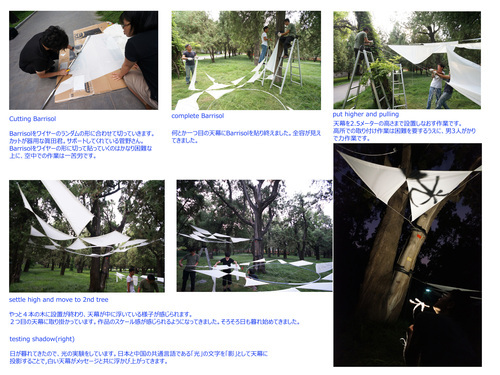 And this art work will be introduced by Concierge-Beijing that is a Japanese community free paper. An extra report from Beijing. 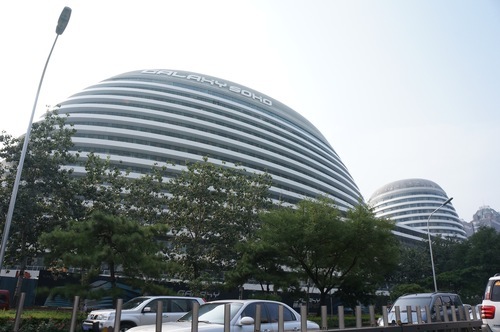 I was interested one round shaped architecture named “Galaxy SOHO”. It was outstanding from other office buildings. I didn’t know who designed it but luckily I had an opportunity to know it by chance. 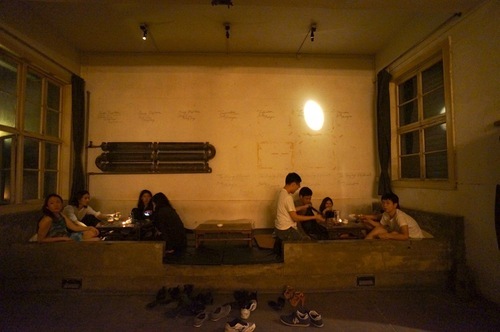 At 3rd day after we finished to work, we went to “Bed Bar” (床吧) which Rem Koolhaas and Yung Ho Chang (張永和) came to drink and talk about their architecture here. I have been here at 6 years ago. 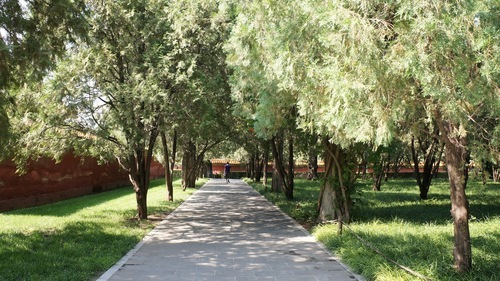 It still has same relaxed atmosphere although it become be deserted. I visited here with my wife and my wife’s friend,Ms.Keiko Suzuki,who introduced some volunteer staffs to join our art work. Mr.Uchiyama who is working at Zaha Hadid Architects came to join us. He is a project chief architect and manage whole project about “Galaxy SOHO”. I have nice opportunity to ask something about the real story from the site. He moved to Shanghai for handling the new projects. I felt it’s cool and smart footwork that he is able to move anywhere he wants. The day of 4th. We started to put Barrisol sheet to the wires. According to wire shapes, it appeared many random-shaped triangles. We feel white coloured Barrisol was getting much of 3D-volume that has contrast with green woods. That relationship is beautiful. After finished to put Barrisol, we hang wires up to the height of 2.5m. A kind of one fantastic landscape finally came out that white triangles looked floating in the air. Actually,this Barrisol triangles have other function. It’s a kind of projector in nighttime. Can you guess which kinds of letter it is? Luckily it was fine day even a weather broadcast said it’s rainy. Some of our friends come to help us for volunteer work. We could start to set up the site earnestly. We almost finish to tighten wires up. The 2nd day in Beijing. Today we went to a market to get materials and start to prepare the site. We negotiated at material market owner since we cut our pocket. 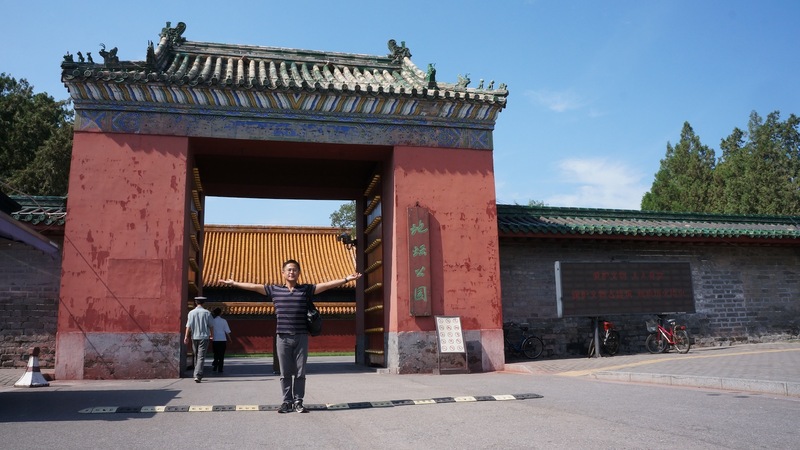 Luckily, kind Beijing people gave us some discount. It looked almost get rain but somehow we finished to set up wires. I felt we are making some holy space to affix wires for art. I love to work at outside because we,almost all of designer,are sitting inside always and everyday. Some volunteer stuff will come to help us. We are so glad they have rich volunteer split and contact us even still we haven’t meet each other yet. Certainly we should create fine work!! 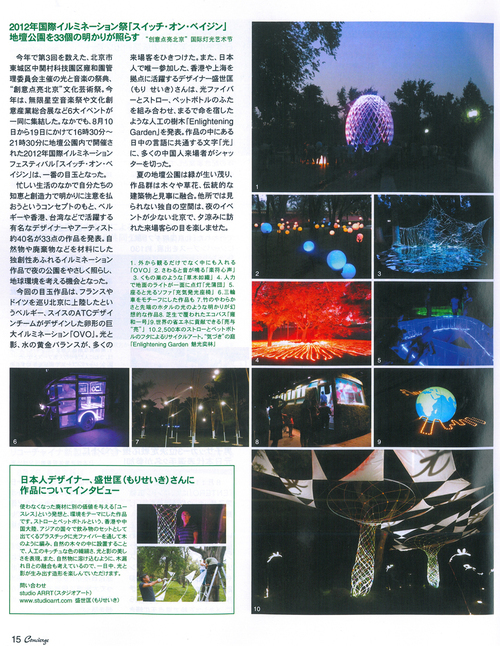 We would like to do live-report about our lighting art installation work from Beijing/北京地壇公園. 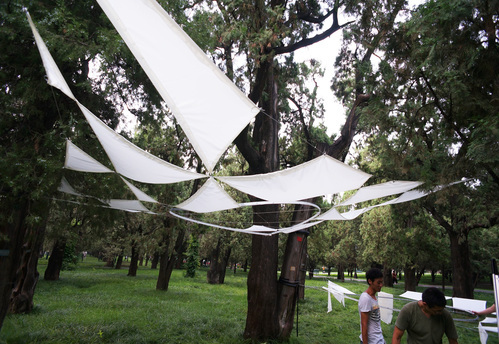 This lighting art event invites a lots of art works from all over the world to use Chinese national park. It became 3 rd times at this year. We,studio ARRT, will try to create one art installation which lighting effect and formative beauty are enhancements each other. 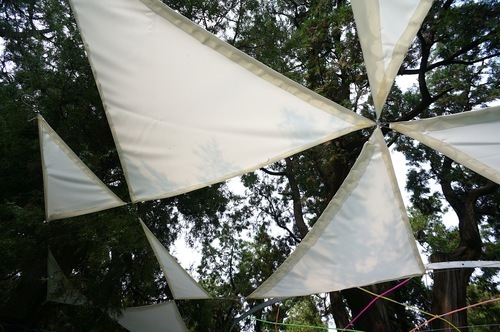 Our theme is the fusion between wonder of lighting and nature. We are glad that our works will alive at this beautiful place. 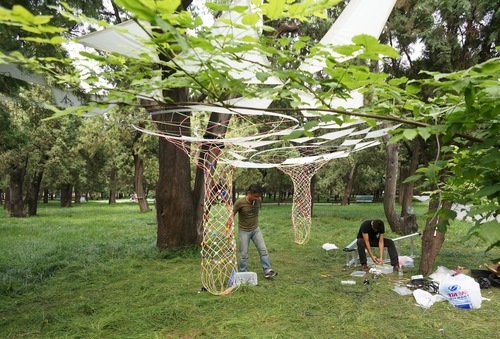 Many of artists will show their art installation at this rich green park. The Event will be started from 10th of August. 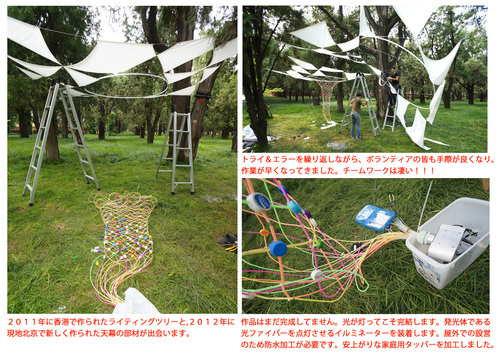 This park will be satisfied by green and art works.